The Islanders were back in action tonight after getting their first win of the season Monday afternoon against the Jets. 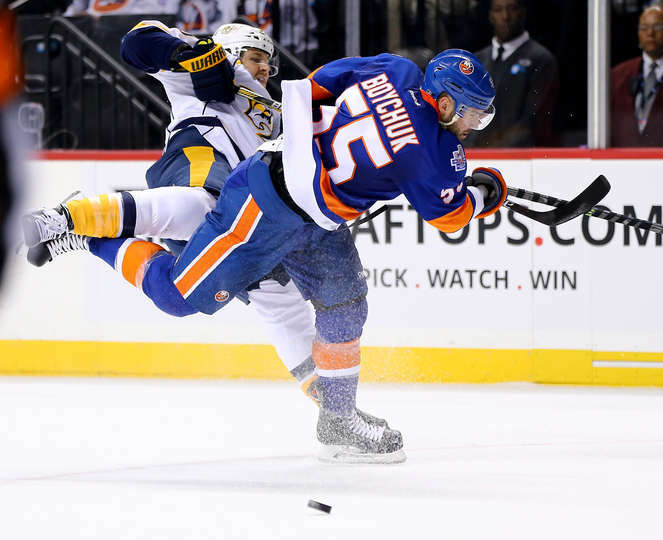 Just like Winnipeg, the Islanders opponent tonight, the Nashville Predators, come into tonight’s match up 3-0-0. This game was another test for the Islanders to start winning at a more consistent pace, as well as start to pile up victories at their new home Barclays Center. The Islanders were outplayed in the first by the Preds. They were flat to begin the game, and Nashville made them pay just 2:17 in to the game. Nashville out shot the Isles 17-7, and the Isles first shot on goal did not come till almost halfway through the period. After going down 2-0 the Isles showed their resiliency that they showed very much last season. Anders Lee at even strength, and Kyle Okposo when the teams played four on four both tallied to get the Isles back in the game. It was a much better second period for the Isles even though they were out shot once again. Thomas Greiss and Pekka Rinne have both had solid starts to the season, and they both continued that trend when they dueled against each other tonight. The first was all Greiss as he faced 17 shots. In the second, both goalies were a lot more active as the game opened up. In the third it was a different story, as Greiss stole the show making some unreal saves to preserve the Isles victory. John Tavares seems to be adjusting just fine to his new digs. His assist on the Lee goal was his sixth point of the season, and sixth point on home ice. Tavares also scored his third goal of the season, giving him a two point night. With all the hoopla about the ice, the Captain seems to be having no problem getting on the score sheet. It took four games, but the Islanders secondary scoring finally began to contribute. Anders Lee, Kyle Okposo, Nikolay Kulemin all found the back of the net for their first tally of the season. It wasn’t the the greatest performance for the Isles, but they gutted it out and came away with the 4-3 win. They have now won two in a row for the first time this season, and have their first winning streak of the new year. They will look to make it three in a row Saturday night when they host the San Jose Sharks.